Winterkorn says sales slide in U.S. has not reached the bottom. DETROIT (Bloomberg) -- Volkswagen AG unveiled plans for a range of hybrid and electric vehicles that CEO Martin Winterkorn says will account for 3 percent of the German carmaker's global sales by 2018. VW will introduce either the Up minicar or the Golf compact, its best-selling model, as a full-electric vehicle in the United States by 2013. Before that, the automaker plans to start U.S. sales of a gasoline-electric hybrid version of the Touareg large premium SUV later this year. The Touareg hybrid already is on sale in Europe. A hybrid version of the Jetta is due in 2012. Europe's largest carmaker spends more than 5 billion euros ($6.5 billion) a year on vehicle research and development. 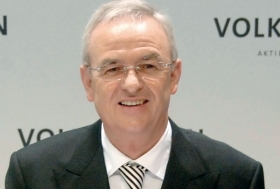 Winterkorn, who will test drive a revamped Jetta compact sedan near San Francisco Tuesday, reiterated his goal of surpassing Toyota Motor Corp., the world's largest auto manufacturer, in profitability and deliveries by 2018. General Motors Co. is planning to build 10,000 units of its new Chevrolet Volt electric car next year, and Nissan Motor Co. will begin selling its all-electric Leaf compact. Tesla Motors Inc. sells the $109,000 Roadster, an electric sports car powered by 1,000 pounds of lithium-ion battery cells. Toyota bought a $50 million stake in Tesla in May as the carmakers plan to cooperate on developing battery-powered cars. An electric version of the Lavida model will also be tested in China as preparation for a broader launch, VW said. Volkswagen will test the second generation of the Golf TwinDrive, a plug-in hybrid that can run about 50 kilometers (about 30 miles) on electric drive, in Berlin later this year, Winterkorn said. The United States will be an “important” market for electric vehicle for Wolfsburg-based VW, which will make research on electric cars a “top priority,” Winterkorn said. VW aims to almost to triple its share in the United States, the world's second-biggest auto market after China, to 6 percent by 2018 and boost deliveries to 1 million cars, including 200,000 units from premium brand Audi. In the first six months, VW boosted U.S. deliveries by 30 percent to 126,000. Jetta sales increased 19 percent to 55,258 cars, accounting for 44 percent of the total. Other models that posted gains included the Tiguan, Passat CC and Rabbit (Golf). Winterkorn, 63, is banking on localization of models and giving up VW carmaker's premium-pricing strategy in the United States to compete with current sector leaders Toyota Motor Corp. and Honda Motor Co.
VW unexpectedly named Mark Barnes and Michael Lohscheller on June 24 to run the U.S. operations on an interim basis, saying the company was holding contract talks with U.S. chief Stefan Jacoby. The negotiations focused on Jacoby's obligations to VW before he takes over as CEO at Volvo Cars, people familiar with the matter said June 25. Winterkorn plans to appoint a chief for the unit soon, he said Monday, without elaborating. Jacoby's exit coincides with the final phase of introducing a new Jetta compact, VW's best-selling American model, and as VW prepares to open a factory in Tennessee and present the first car built exclusively for the U.S. market. Volkswagen is targeting a second consecutive year of record global deliveries as it adds about 70 models, including upgrades in 2010. VW, which increased first-half global deliveries 15 percent to more than 3.5 million units, sold 6.29 million cars and SUV in 2009. Winterkorn said he expects that the money-losing U.S. unit will be profitable “shortly."